The 416 Fire burns Monday on the southwest side of Hermosa Creek, as it moves west. 5 p.m.“Don’t be a Lookie-loo!” – that’s the message from the Colorado Department of Transportation. CDOT sent out a message late Monday urging people to steer clear of the south closure point on U.S. Highway 550 near Hermosa. Stopping, parking and standing outside of vehicles along the highway is not permitted. The speed limit in the area has been reduced to 35 mph. 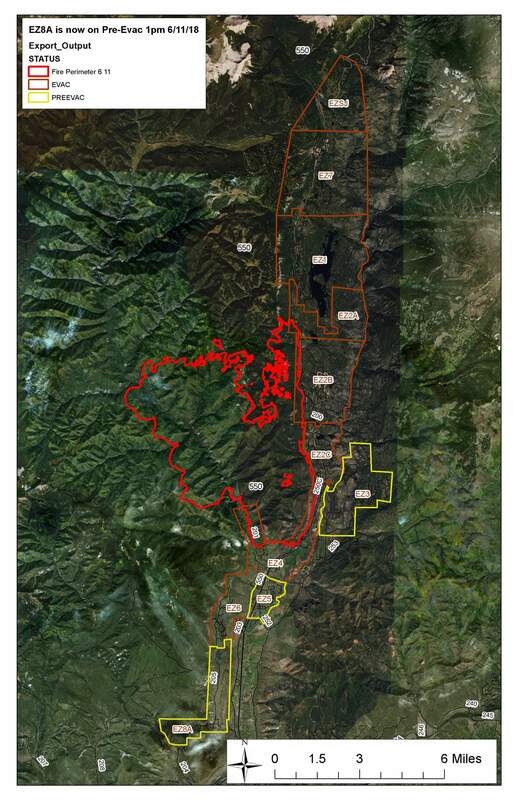 1:30 p.m. A pre-evacuation notice was issued for 127 homes along County Road 205. 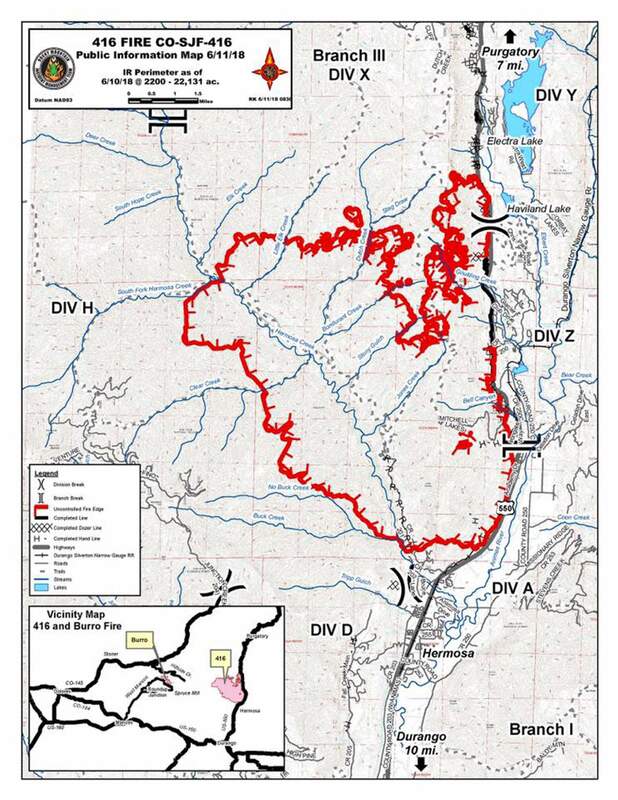 The pre-evacuation includes the east and west sides of County Road 205 from the intersection with County Road 204 to the south and the Falls Creek subdivision to the north. A CodeRED notification was mistakenly sent to residents on County Road 203 east to the Animas River, between Trimble Lane and 32nd Street. La Plata County spokeswoman Megan Graham said a correction notice was sent to residents. 10:30 a.m.Firefighters once again held back the 416 Fire from homes in the Hermosa area. As of 10 a.m. Monday, the fire has grown to more than 22,130 acres. 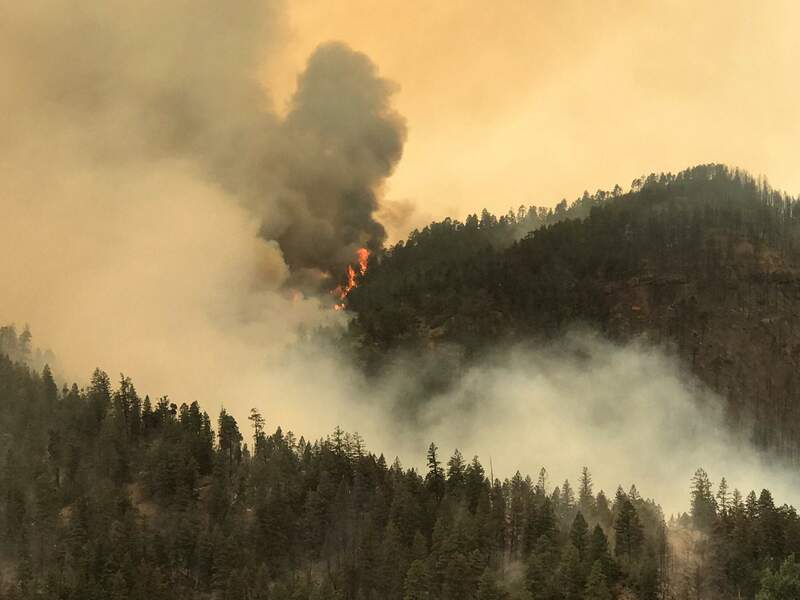 Shawn Bawden, public information officer for the 416 Fire, said Monday morning that the fire started moving south toward Hermosa around 5 p.m. Sunday. Within an hour, the fire had advanced a mile and was within a quarter mile of homes. Included in the aerial fight was a DC-10 Air Tanker, known among fire fighters as a “VLAT” – Very Large Air Tanker – was brought in to drop fire retardant. Bawden said the DC-10 is one of the largest air tankers in the country. On the ground, firefighters used direct attack strategies, which included burnouts that remove flammable vegetation between homes to create a buffer from the fire. According to a news release Monday morning, fire officials will have an update on the acreage of the fire later today. As a result of Sunday night’s effort, no homes or structures were lost. The fire also has been held back from crossing to the east side of U.S. Highway 550. Bawden said weather conditions Monday are expected to be dry, hot and windy – almost identical to Sunday. That could result in extreme fire behavior. The National Weather Service says the temperature Monday may be a high of 85 degrees, with winds between 5 to 10 mph. A similar forecast is expected for Tuesday and Wednesday. A chance of rain enters the region Friday through Sunday. The U.S. Forest Service announced Sunday it intends to close the San Juan National Forest because of the fire danger. The closure is expected to take effect Tuesday. The Forest Service said late Sunday that the Burro Fire, which started June 8, has grown to more than 1,000 acres. That fire is about 12 miles from the 416 Fire on the San Juan National Forest. It is zero percent contained. A Type 1 Incident Management Team that took command of the 416 Fire over the weekend assumed management of the Burro Fire this morning. The west side of the fire is expected to grow as it moves into areas with heavier fuels, according to a Monday morning update. On the south and west side of Hermosa Creek, the fire is continuing through the Hermosa Creek drainage. The fire has entered Buck Creek drainage. South of the fire, crews have connected a line from Highway 550 northwest into the rock face above Hermosa. The fire has been relatively quiet near Haviland Lake. 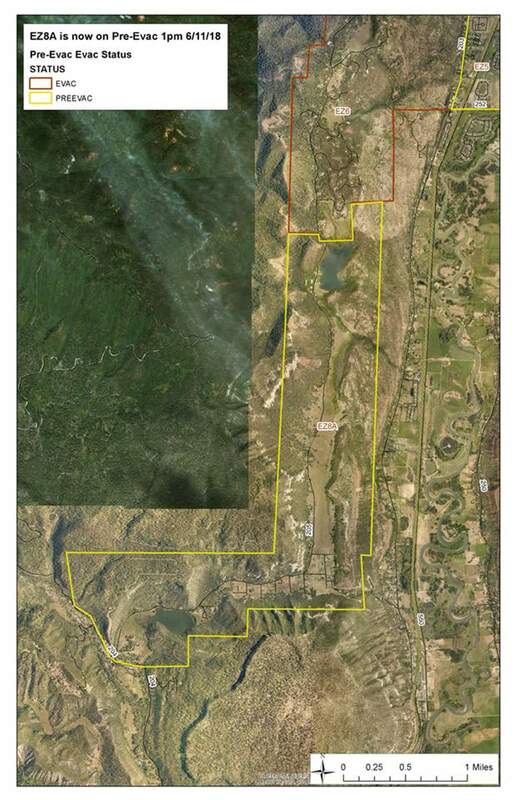 Crews will improve a fire line around Purgatory Resort on Monday. U.S. Highway 550 will be closed Monday from mile marker 32 to 64, which is from Cometti/Mead Lane to the top of Molas Pass. This is a developing story. Check back at durangoherald.com for updates.